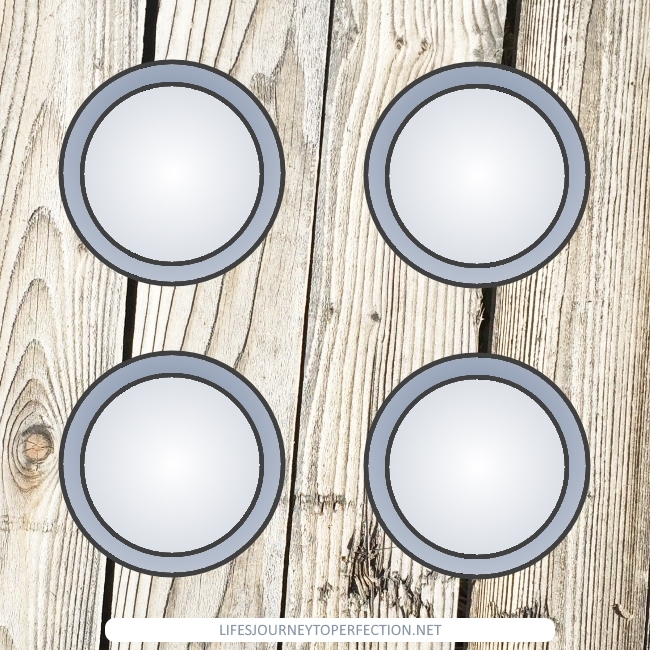 Life's Journey To Perfection: 2017 LDS Sharing Time Ideas for September Week 4: I should respect others. 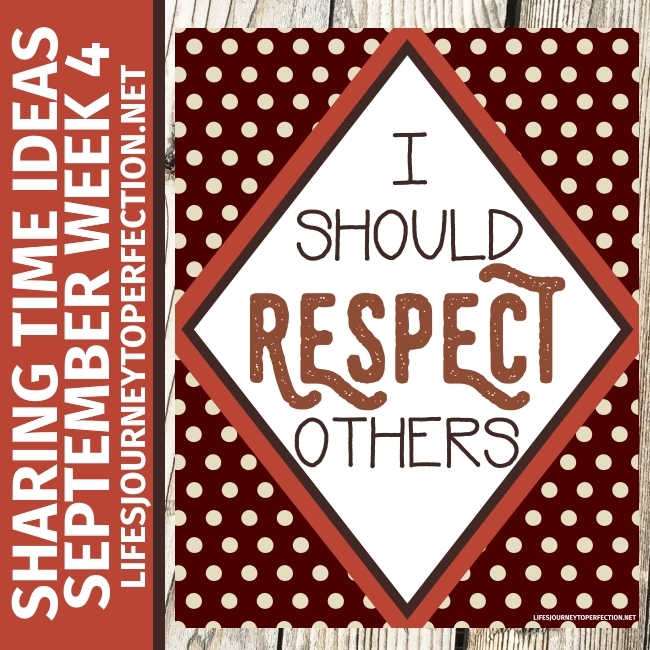 2017 LDS Sharing Time Ideas for September Week 4: I should respect others. September Week 4 Topic: I should respect others. Begin primary, by telling the primary children that you have a very important question for them. 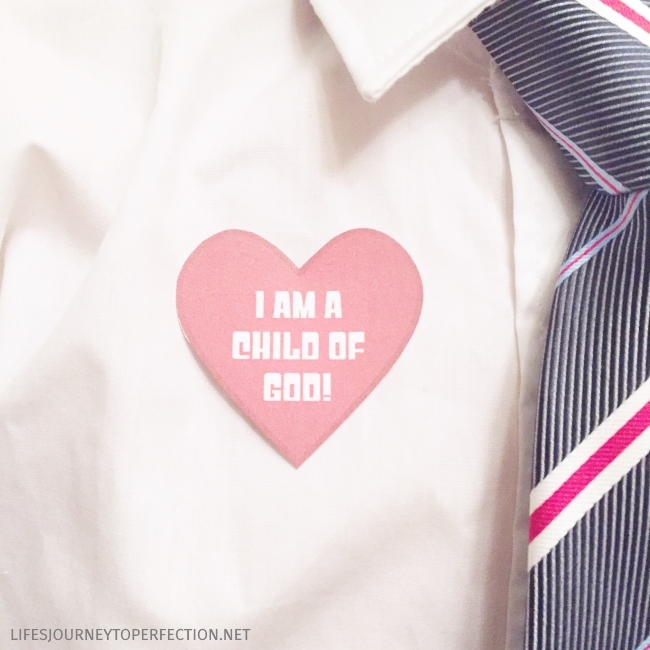 Ask them, "Who is a child of God?" Explain that everyone who has and will ever come to this earth is a child of our Heavenly Father and that He loves each of them every much. 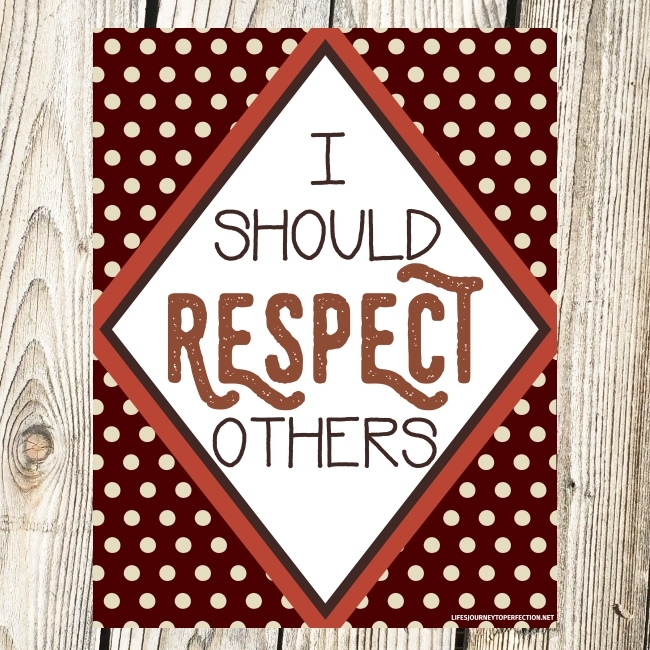 Show the primary children the week's theme poster and invite them to repeat, "I should respect others." Explain that because we are Heavenly Father's children and he wants us to love each other, we can do so by respecting each other. Explain that now we are going to play a little activity to help us learn about showing respect to each other. First set up the activity, place four containers onto the floor, inside of the containers place one of the word strips. (See Free download for the word strips: Be Honest, Be Kind, Be Grateful, Be Forgiving) If they don't fit, then fold the papers or roll them up. Continue, until all of the word strips have been discussed. To close share your testimony on showing respect to others. Be Honest: Part of honesty is that we don't tell lies, we don't cheat and we don't steal. It is showing respect to others and their property when we are honest. Be Kind: Everyone needs someone to be nice to them. They need a friend, someone to talk to, to play with, someone that smiles at them, be that friend to everyone. Showing kindness is definitely a way to show respect. We are all God's children and when we recognize that we are going to show more respect to others. Be Grateful: When we are grateful then we appreciate the things others do for us. We recognize all that Heavenly Father has done for us. As we show appreciation then we are showing respect. We will also appreciate what we have and not covet what our neighbor has. Be Forgiving: Everyone makes mistakes. When we are forgiving then we are showing respect, love and understanding towards that person. 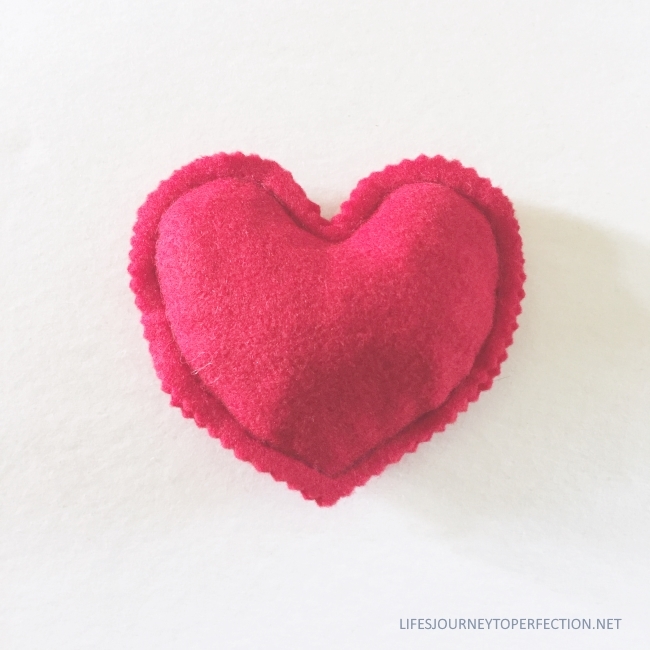 You can either hand sew or sew on a sewing machine, it is up to you. 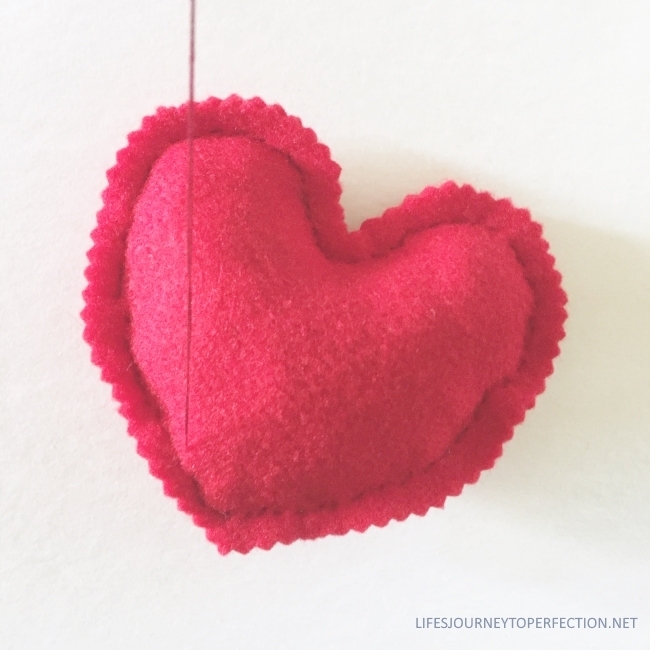 First cut out two hearts out of red felt. I used pinking sheers to cup mine out. 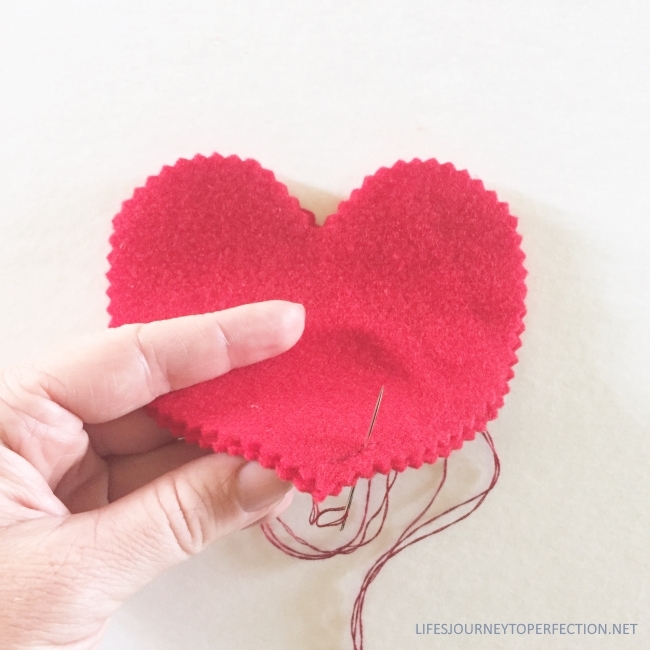 My hearts are 4 1/2 by 4 1/2 in size. If you are hand sewing you will need embroidery floss and a needle. 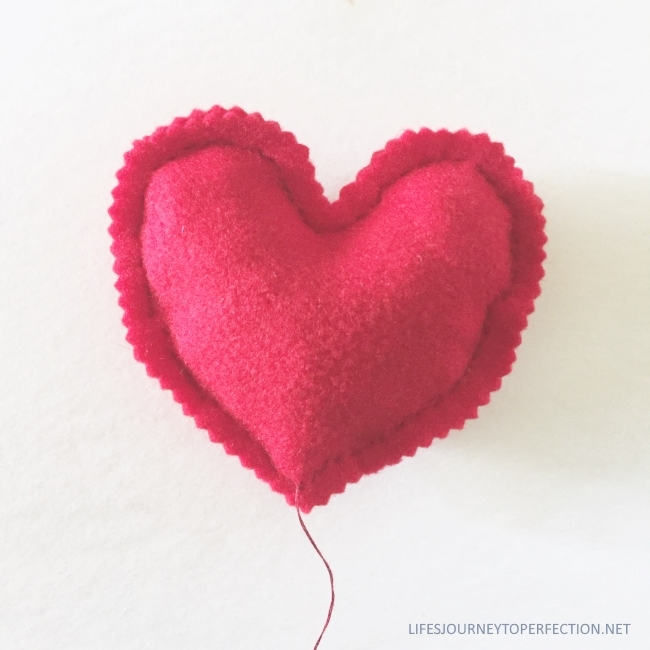 Place the to felt heart pieces together. insert two strands (together) of embroidery floss into the eye of your needle. 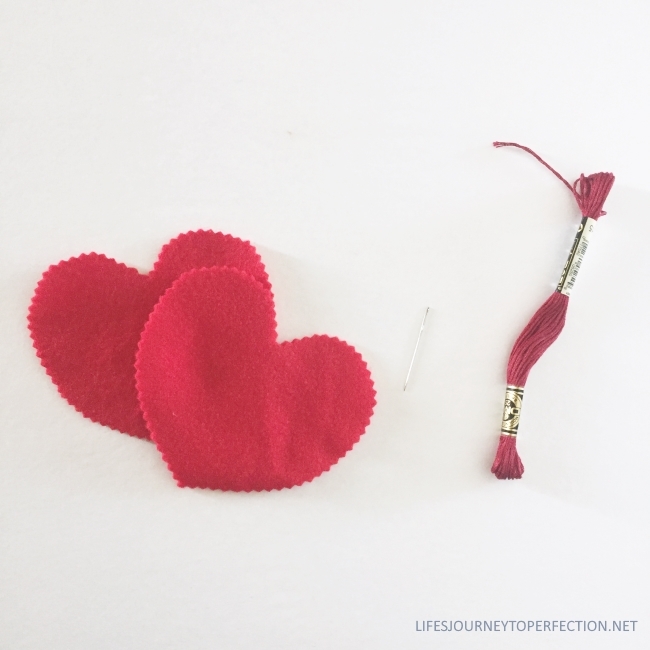 To begin hand sewing, tie a knot at one end of the embroidery floss. Then insert your needle in between the two layers. This will hide the knot and end of your floss inside of the bean bag. To make your bean bag so no beans will fall out. 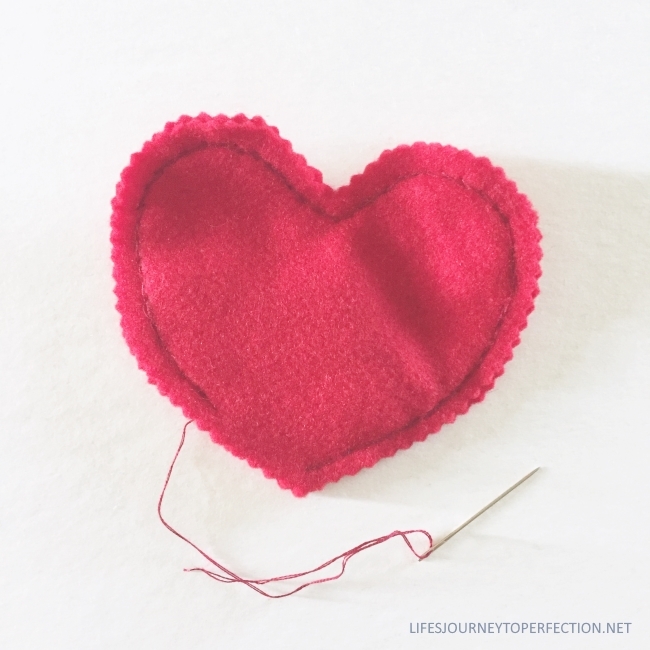 You can either do a back stitch or a split stitch. 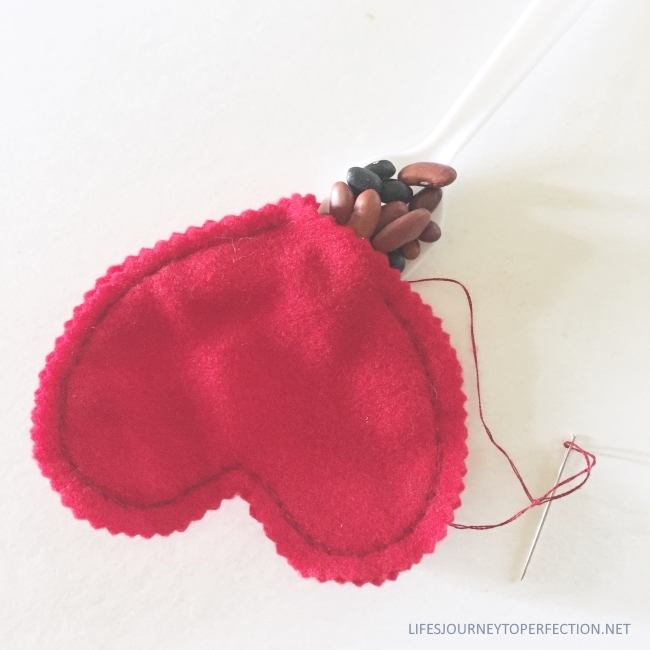 Continue stitching the whole way around the heart, leaving an inch or so open, so you can insert the beans. When I have a bag of beans that are getting old I place them in a container, so I can use them for projects like this. Using a spoon, spoon your beans into the heart pouch. Until it is filled up. Leaving room so you can sew up the hole. Sew the hole shut and on the back side knot the end. Here's a little trick, so you don't have any loose strands. 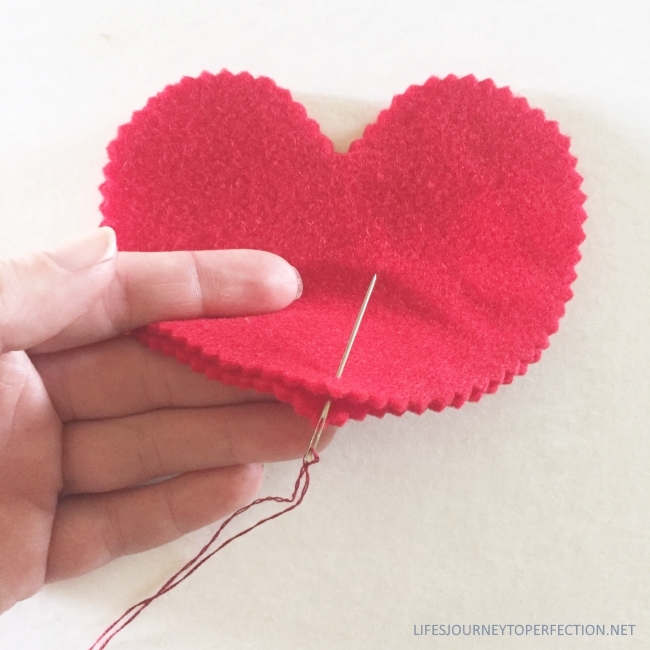 After you tie off the end, place your needle back through and then pull up probably an inch away, then cut off the end, this will place the loose end inside of the bean bag. 2017 LDS Sharing Time Ideas for September Week 2: I should respect and worship God. 2017 LDS Sharing Time Ideas for July Week 4: Honesty is telling the truth regardless of the consequences. Thank you so much! This is wonderful. Thank you so much Jamy!! Thank you for your ideas! I will use this in Sharing Time tomorrow. Maybe you are not aware, but you have a South Park ad showing a guy on the toilet right in the middle of this blog post. Thank you Marie! No, I usually do not see the same ads that you do, because it goes off of each person's individual cookies from their computer as to what ads are displayed. I do have some major filters on, but it seems like every now and then things come through. I am sorry! If you find an image that you feel is inappropriate, click the report this ad button. Thank you! !